Why is William Flynn not held up in the same standing as other elite architects of the Golden Age? 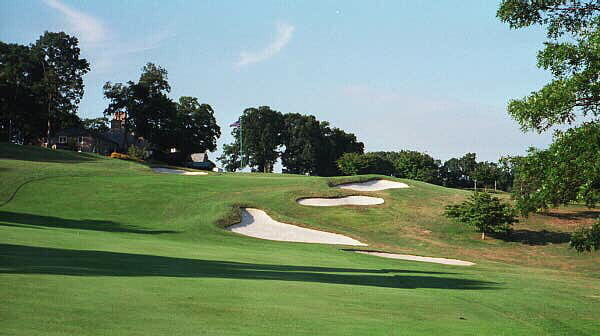 His best work, Shinnecock Hills, is considered by many the best course they have ever played. His body of work includes Rolling Green, Huntington Valley, Indian Creek, Cherry Hills, Lancaster and Lehigh to name a few great courses. Put his work up against Colt, Mackenzie and Ross and his quality holds up well. Critics say that Flynn was a good, but his work all looks the same. I think this is where our modern outlook of golf course architecture lets us down. We are in an era where the average player thinks a golf course should be friendly to play and beautiful to the eye. It’s no longer about excellent shot values; it’s now about shots from the camera. Today’s popular architecture is all about marketing. The problem for an architect like William Flynn is how do you market great shot values? Fortunately time always brings the best work to prominence, subtle greatness such as Pinehurst #2, gets realized through play. William Flynn’s work is the same, to understand how good a strategist and architect he was, you need to play his courses. Let’s take a look at Huntingdon Valley to understand how he thought. Huntingdon Valley is set in a wonderful steep sided valley with a beautiful brook running through the property. The routing of the course breaks convention by running along the slopes as it works its way around the valley. Think of a Nascar track with steep sided banks as the routing for the front nine. 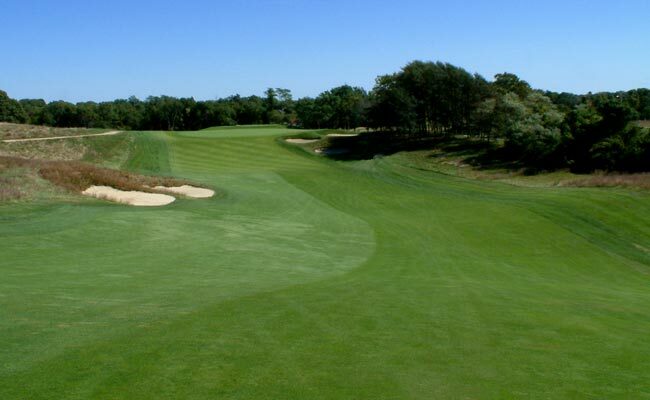 The result is a series of holes where cross-slope becomes the dominant factor on how each hole is played. Conventional wisdom would have had more holes going up and down the slopes and particularly more doglegs going with the natural terrain. This approach would have made the course “fairer” and would have offered flatter lies to the player. Flynn’s reason to take a different approach was because he was instructed by the membership to build a true championship golf course. What Flynn envisioned was a test of shot making to create the best players, so he created situations where unless the player was going to work the ball into the natural cross-slope, they would not hit fairways. He then took it one step further by applying the pressure of having the holes dogleg against the slope. The only way to hit this fairway is to work the ball into the slope to hold the hill. What made this style of hole even more challenging was the second shot. The player was in a situation where he had to draw a ball from a fade lie or fade a ball from a draw lie just to hold the green. Now this added a great deal of pressure to the skills of a player and only rewards a skilled shot maker able to craft the correct approach. Flynn did not always call for this, often there were options to use the hill as a feeder slope into the green with a bounced in approach; but what made his courses challenging and interesting was his occasionally insistence on the player meeting a specific challenge. Some of the holes at Huntingdon Valley are unpopular to the “fair play” crowd, but they make an excellent test to player’s ability without always resorting to the uncreative option of simply adding length. Another great example of his cunning is the 10th at Shinnecock Hills. The tee shot plays down hill and the player is left with a downhill approach to a raised green. The back of the green is shaved to shed the ball and the front of the green is a huge slope that will back the ball all the way to the bottom if the approach is too timid. As Johnny Miller said in the broadcast, I have played this hole dozens of times, I still have no idea what to do, but for some reason I look forward to playing each and every time. His main influence must have been Wilson’s masterpiece of Merion. The course is a perfect test of shot making; due mostly to the use of all of the subtle slopes to influence positioning. Anyone visiting Merion is taken by how efficiently and effectively the land is used on each hole. Merion’s bunker placement is stunning, both directional and strategic bunkers are used to define each set of shots. They help set off the angles of greens and fairways so that the strategic placement of shots is easily visible to the player. Finally, the green contouring is bold enough to challenge putting and to dictate play from the tee. Like Merion, he used the slope of the land to dictate how the course should be played; and like Merion he used well placed directional and strategic bunkering to define where the ideal line was into each hole. Whether the bunker was placed to indicate a useful slope or even a kicker to get more distance, a carry line where the player was rewarded with a better angle into the green, or as a warning bunker to show where to play away from, each bunker was important. Since the strategic value of his bunkering was so important; he would rarely place any extra bunkers just for framing or to simply add beauty. Detractors may have said this makes Flynn’s bunker work a little dull, but I would counter that this makes his architecture extremely honest. Flynn’s bunkers were much understated. They are open fronted for easy viewing, and flashed high for clear visibility. The Flynn look had more to do with clarity than visual stimulation. While not the fancy shapes of Thomas or Mackenzie, they still have their own subtle charm. William Flynn greatest strength as an architect was his strategic vision. He demands that you focus on each and ever task throughout the entire round. He challenges you create shots from all sorts of different stances. He insists on courage and precision when attacking the course. To play well; you must use the land to make shots, understand the ideal angle for each approach, and position yourself on the greens, and of course putt well. He may not get the national attention of a Donald Ross, but Flynn is every bit the equal of the elite of Golf Architecture. Posted by Ian Andrew at 7:21 a.m.
For the past 19 years, I have worked as a Golf Course Architect. In 2006, I opened my own design firm to build the courses that I think golf desperately needs built. Courses that have less earth-moving are less expensive to build and feature far more hand-made detailing to create something special. I am best known for my restoration work, particularly courses originally designed by Stanley Thompson and Walter Travis. I am member of the American Society of Golf Course Architects. All text within this web log is the copyright property of Ian Andrew and cannot be republished, in whole or in part, without the express written permission of the owner. Use for the purpose of non-profit education is permitted with appropriate bibliographic recognition.